The British Legion club on Eversley Road stands on land that used to hold a Congregational Chapel. We don't currently have photos of the Chapel, but we do have an extract from from a book written in 1905, which tells us how the Chapel came about. History of the Berkshire, South Bucks and South Oxon Congregational Churches, by W. H. Summers, published by W. J. Blackett, 1905. It appears from a notice in the ‘Congregational Magazine’ for 1841 that a small Congregational cause existed on this village at that date, under the care of a Mr. W. Breach, but I have found no further trace of its history. 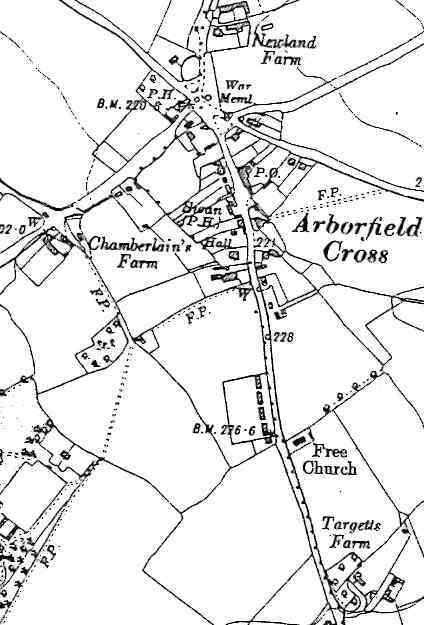 In a series of village missions, held in 1896 under the auspices of the Reading Free Churches Federation, Arborfield Cross was one of the places visited. Shortly after the mission, the Federation received a memori al, signed by over seventy villagers, representing that there was no accommodation for Free Church worship within three miles, and asking if the Federation could meet the wants. As services had previously been carried on in the open air, in connection with Broad Street church, by members of its Christian Endeavour Society, that church was requested by the Federation to undertake the work. The request was acceded to, and a timber-built chapel, which had been used for private services in a neighbouring village, was purchased and re-erected at Arborfield, at a cost of £380. It was opened on the Bank Holiday in August 1899, when a service was preached by the Rev. Dr. Glover, of Bristol. Several members of the federation, representing various sections of the Free Churches, contributed liberally to its funds, and the services are attended by worshippers of several denominations. Kelly's Directory noted that the Congregational Chapel was opened in 1899, and that it could seat 200 people (as compared with 220 at St. Bartholomew's). By the 1939 Directory, the building was listed as the 'Salvation Army Hall, erected in 1899, seating 200 people', with no mention of its Congregational origins. The first Salvation Army wedding to be held in the village took place in the Army Hall on Saturday, when Miss Freda M. P. Devereux, eldest daughter of Mr. and Mrs. F. Devereux of Council Houses, Barkham, was married to Mr. William L. Jones, eldest son of Mr. and Mrs. L. T. Jones, of Dowlais, South Wales. The bridegroom, who returned in December from Canada where he had been farming, has been a member of the Salvation Army for thirteen years, and his wife for two. They are both well-known in Barkham, and have been associated with open-air services in the district. The bride was married in uniform, wearing a white sash and a white carnation, and her maid of honour, Mrs. West, was attired in a grey costume. Captain M. Kernaghan, the Commandant, conducted the ceremony, and Mr. F. Field acted as best man. Among the guests at the reception, which was held in the hall, was Mrs. Warren (the bridegroom’s sister), who had been married a few hours earlier at Crowborough, Sussex. Correspondence had been conducted between John Sargeant, Superintendent Registrar of the Solicitors Brain & Brain, and E. Francis, Esq., of 172 Friar Street, Reading. An application form had been submitted by John Harper of Chelmarsh, Crown Street, Reading, for a Free Church Meeting House near Arborfield Cross. It also described the applicants as ‘Congregationalists’. It was dated 4th October 1899 and signed by John Harper, ‘an attendant of the Place of Meeting’. On 18th May 1915, there was a printed form beginning: ‘Under the Finance (1909-10) Act 1910, Duties on Land Values’ concerning an Amended Provisional Valuation of the Congregational Chapel, Arborfield, in the ‘Parish of Arborfield’ (it was in Newland). The land occupied 28 Perches, and the original valuation was reduced from £225 to only £25. The organisation was described as ‘The Society or Congregation of Protestant Dissenters from the Church of England commonly called Independents, of Broad Street Independent Chapel'. The land had formerly been ‘part of the farm and premises here known as Targett’s Farm, sold by Elizabeth Ayres in 1899'. The Indenture provided for the Trust to be able to sell the land and premises after a year not in use as a Chapel or Meeting-House. It went into a lot of detail about the powers of the Trustees and of the Church Meetings that could appoint replacement Trustees. The document was signed by all of the parties. Nearly two decades later, there was a letter from the solicitors to Dr. Paul White of St. Patrick’s Hall, Northcourt Avenue, Reading, dated 29th March 1965. It mentioned the sale of the Chapel to the British Legion in October 1946 for £420 – 8s – 9d, paid by Gerald Hampton to M. Attwood, treasurer. The proceeds were invested. The letter mentioned the Broad Street Chapel Trustees. A further letter from Brain & Brain to C G Shorter of Upper Woodcote Road, Caversham RG4 7HJ, dated 26th March 1969, confirmed that the Trustees of Broad Street Chapel, even though they weren’t the original Trustees, had the power to decide how to deal with the proceeds of the sale back in 1946. Among others, they provided financial help to congregations at Rokeby Hall and at Grange Free Church, Southcote. Final correspondence in the file was a set of letters from the main recipients, thanking the Broad Street Trustees. or its time as a Salvation Army Hall?